No ionising star has been identified in the scientific literature for Sh 2-58, which is prominent in infrared as the bubble [CPA2006] N30 as well as in radio. Avedisova includes Sh 2-58 in the star formation region SFR 23.13+0.55, along with the molecular cloud SYCSW 317 and the compact radio HII region [L89b] 23.115+0.556. 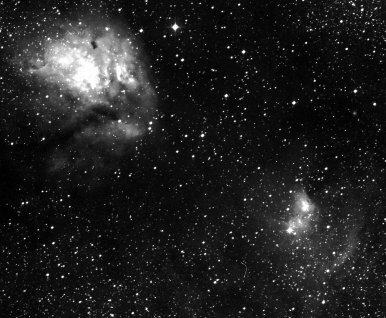 Sh 2-57 and Sh 2-58 are visible together in the sky (as shown by this hydrogen-alpha image), divided by the dark nebula LDN 446 and just east of the Scutum Supershell. However, they seem to be located at quite different distances, with Sh 2-58 at about the same distance as the Supershell and Sh 2-57 in front of this region. No significant references appear in the scientific literature for this nebula, which lies in the approximate direction of the star cluster NGC 6664 and can be seen in hydrogen-alpha as the brightest portion of a much larger nebula at the edge of the Sct OB2 association. The hottest star in the direction of this diffuse nebula is the O6 class HD 172275. This large nebula is most often named GAL 025.4-00.2 or GAL 025.38-00.18 in the scientific literature. It has a bewildering number of different names in SIMBAD (not all cross-referenced). It may be associated with the radio source W 42. It is visible in infrared as the prominent bubble [CPA2006] N37 and appears to be ionised by an obscured O7 II giant. The radio source W 42 has wildly varying distance estimates (from 13400 parsecs to 2200 parsecs). If the near estimate of 2200 parsecs (which is from a recent paper published in 2000) is accepted, then W 42 is likely part of the Sh 2-60 nebula. Infrared imagery in the same paper shows that W 42 is energised by a massive, dense and young OB star cluster embedded in an obscuring dust cloud in the bottom left part of this image. This is the W 40 star formation region, also called LBN 90, which is ionised by the three B1V stars W 40 OS 1a, W 40 OS 2a and W 40 OS 3a. It is obscured by the Aquila Rift dust clouds, which are located between W 40 and our solar system. A 2010 paper using the Herschel infrared space telescope argues that the W 40 complex is embedded in the Aquila Rift at a distance of about 260 parsecs. You can see this region much more clearly in this false-colour MSX 8μm infrared A-band image. This nebula is ionised by the B1 II giant [F89b] S65 4, a star which is not yet in the SIMBAD catalog. The exciting star for this HII region is the O9.5 III giant LS IV -02 16. This compact HII region is ionised by the B0.5 IV subgiant [F89b] S69 2. It is also a radio source and lies at the centre of a prominent infrared bubble. The RCW catalog describes this as a 2x2 medium bright object. However, there is no visible nebulosity at this location in DSS photographic plates and no references in the scientific literature beyond the RCW catalog itslef. This relatively large HII region might be ionised by the B0.5 IV star BD +2 3762 according to Forbes, but this is uncertain. This nebula is prominent at radio frequencies as can be seen in this Effelsberg image and this VLA image and lies at the centre of a faint infrared ring as can be seen in MSX. You can find a good visual frequency image here. The RCW catalog describes this as a 1x1 arcminute bright "Stellar-like" object. There is no visible nebulosity at this location in DSS photographic plates and no references in the scientific literature beyond the RCW catalog itself.